Never kick on compression will kick back and will set off kick start sheer gears or will fracture cases "excluded from warranty as its rider error"
4 valve engine Inlet 4 thou/0.10mm. Exhaust 4 thou/0.10mm. Check every 500 miles. 2 x Spare wires Black/white or 2 x White are for Rev switch control, open = Full reves Closed = Rev control via brass screw on unit. Below piston image is of one that was run on a way to big carb and resulted in a major melt down, wasn’t a lack of oil as it would look like at first, first singe of low/lack of oil is camshaft and rocker failure. So if you are using a carb of your choice make sure ist the right size for CC and Valve size. 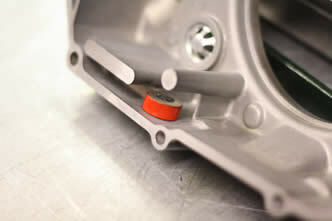 Always use the recommended weighted flywheel we supply with the engine. Using the incorrect weight can result is crankshaft taper sheering off. Also make sure you are running the right gearing so that the engine is not over revving when cruising, common issues are running i.e 50cc gearing when you up grade to a 70 or bigger engine, doing that’s will result in the flywheel working its self lose and sheering off the woodruff key.